A screenshot of the C-Cure 9000/Salto solution. Tyco Security Products announces the integration of its C-Cure 9000 security and event management system from Software House with Salto offline locks for seamless access control of an entire building through a single user interface. The company has also updated its video surveillance system. The C-Cure 9000/Salto solution is designed for access control systems that require varying levels of security for interior and exterior access points. The solution deploys Salto offline locks for interior doors that require a moderate level of security, such as storage and office areas, while Software House hard-wired door controllers are used for high security and perimeter access points. With this solution, security operators can control access to all doors into and within the facility through the C-Cure 9000 user interface, based on communications between the system and the Salto server. “The C-Cure 9000/Salto solution is a powerful integration that simplifies access control management by joining offline locks and hard-wired doors together,” says Rafael Schrijvers, access control product marketing manager, EMEA (Europe, Middle East and Africa), Tyco Security Products. “With C-Cure 9000 and Salto, facilities can manage their entire access control infrastructure with a single credential and management platform,” he adds. The C-Cure 9000/Salto solution supports a virtually unlimited number of offline locks and uses Salto online readers to update cards for offline reader access. The use of access cards for doors instead of mechanical keys results in cost savings, saving human and monetary resources previously spent on lost key replacement. The C-Cure 9000 guided user interface and single sign-on credentialing makes access control management more efficient and user-friendly. With this lock solution, no cabling is required for lock installation and offline locks can be installed on almost any door type. 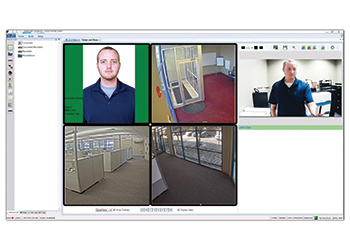 Meanwhile, Tyco has introduced a new facial biometrics feature within its VideoEdge video surveillance systems that provides immediate verification and detection of individuals. With Face Detection analytics, operators can be proactively notified that the surveillance system has detected a person of interest, whether VIPs or other persons of importance or ex-employees or known criminals. “This technology can be useful in protecting stock and assets by alerting security to potential risks much sooner than normal, or increasing customer retention by alerting the store manager to greet an important customer entering the store,” says Stuart Bettle, video product marketing manager, EMEA, Tyco Security Products. Up to 1,000 individuals can be easily enrolled and stored in VideoEdge’s on-board database, with the ability to store multiple faces for each person in the system for the highest possible accuracy in identification. Face Detection is a valuable analytics feature built into the VideoEdge network video recorder (NVR), eliminating the need for costly external servers dedicated to powering the analytics. The analytics can also be used “post-event” to speed investigation times by searching video only for specific persons, enabling operators to search video for certain criteria – for example, those individuals who had access to the surrounding area of the incident. Known faces can also be enrolled with video associated for faster future investigations. When used in conjunction with the C-Cure 9000 security and event management system and the victor Unified client application, operators and guards can be visually alerted if a mismatch is detected between the live video image and the stored access control credential image of a card which has just been used on the system. Visual verification of the cardholder greatly increases security to the most vulnerable areas of a business. Tyco Security Products and its leading brands conduct business in over 177 countries around the world and employ over 2,800 employees globally, including research and development, marketing, manufacturing, sales, service and logistics teams in the Americas, Europe, the Middle East, Africa, and Asia Pacific. Its products are applied across multiple industries and segments including healthcare, government, transportation, finance, retail, commercial and residential. “Tyco Security Products helps protect 42 per cent of Fortune 500 companies, transportation systems on five continents, 37 per cent of the world’s top 100 retailers, over two million commercial enterprises, thousands of students in more than 900 educational facilities and over five million private residences,” says a spokesman for the company. Software House security and event management systems are part of the Tyco’s security products business unit.